I Scream, You Scream, We all Scream for… Pie!!! It looks hard, but I promise you, it isn’t. In a large saucepan, combine milk and half and half and bring to a simmer over medium heat. Turn off heat and set aside. Whisking constantly, gradually add the brown sugar mixture to the hot milk mixture. If mixture is not smooth, blend for 20 seconds with a hand mixer or pour through a fine sieve. Put the egg yolks in a medium bowl. Whisk in about 1/2 cup of the hot milk mixture. Whisk in cornstarch and salt until dissolved. Whisk the cornstarch mixture back into the hot milk mixture in the saucepan. Add the Scotch and whisk in. Whisking constantly, cook over medium-high heat until thick and just boiling. When the mixture thickens, the whisk will leave trail marks on the bottom of the pot and the mixture will have a few large bubbles boiling up to the top. Remove from heat and whisk in the vanilla extract. Pour into the pre-baked pie shell and cover with meringue. Then chill at least two hours or overnight. Whip whites and salt to soft peaks, then add sugar and whip until sugar is dissolved and whites are glossy. 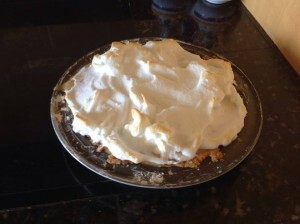 Spread meringue on top of the slightly cooled pie and bake for five minutes or until lightly browned. Chill as above. Put flour into food processor fitted with a metal blade. Add butter and shortening and pulse a little at a time until mixture is crumbly and about the size of peas. Don’t over mix. Add water one Tbsp at a time, pulsing briefly with each addition. As soon as the mixture forms a ball, stop (you may need more or less than 6 Tbsp water). Wrap in wax paper and refrigerate 30 minutes. Divide dough in half and roll half to fit a 9-inch pie pan. Place in pan. Bake at 425 degrees until golden brown. Roll out the other half, put in pan, wrap in freezer paper or freezer bag and freeze unbaked for later.